Tin Can Knits is the collaboration of two Canadian designers; Alexa Ludeman and Emily Wessel. With accessible and clearly written patterns, beautiful photography and heartfelt stories, and we aim to share our love of knitting, and inspire you to do the same! 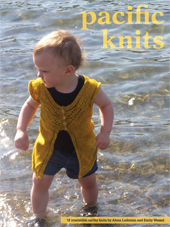 From our very first book in 2011 (featuring Alexa's first baby, Hunter), our catalog of popular knitting patterns has grown along with our families! We love to design and knit, and most of all we love to share our passion with other knitters. Alexa lives in her hometown of Port Moody, Canada with her husband Gary and three kids: Hunter, Jones and Bodhi. With a background in teaching and photography, she brings a discerning eye and a creative flair to Tin Can Knits. Born and raised on Vancouver Island, Emily is an expat living in Edinburgh, Scotland, with her husband John and son Max. With a background in architecture, she brings her clear design sense and project management skills to Tin Can Knits. Here Tin Can Knits we love all things knitting and design. We love lace, cables, textures, garments, accessories, sizes for all, and we don’t really enjoy seaming. We want the finished items from our patterns to be beautiful and the process of making them to be fun. With clean modern designs and seamless constructions our patterns can be enjoyed on every level. Our patterns are written in a minimal style, often using charts to illustrate stitch patterns. We are committed to clear and simple pattern writing, fabulous photos, and excellent pattern support. Each of our patterns has been professionally tech edited and test-knit. Having a problem? Check out our great in-depth tutorials! If you still have questions, drop us an email.